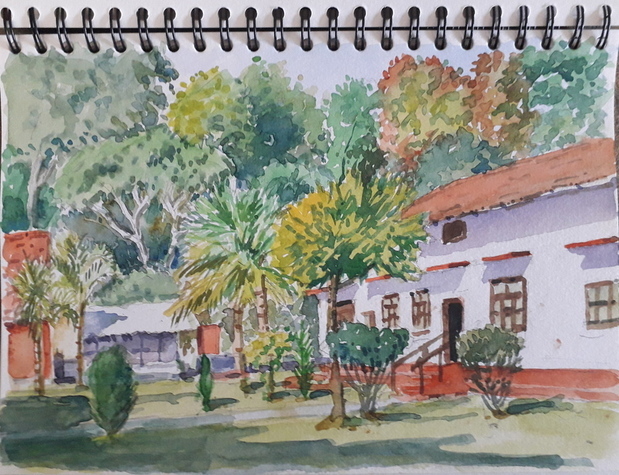 Watercolour painting of the 'Bison Manor Lodge, Kutta, Karnataka, India done while on a visit to India in February 2019. My painting trip to Achill, Co Mayo commencing on 9th June is full. This year's Painting Day in the Bay Garden, Camolin. Co Wexford is on wednesday 21st August 2019. We arrive at 10am for a cuppa and introduction, then Frances MacDonald brings you on a guided walk in the garden. Then after my introductory talk we commence painting in the garden. We break for lunch at 1pm and then after lunch around 2pm we return to our easels and paint till around 4.30pm. Then I do a critique of the work accompanied by a cuppa before leaving. The cost is €70 including lunch. My Painting trip to Antequera in May has been cancelled due to circumstances outside my control. We had a wonderful day painting in the Bay Garden, Camolin on wednesday 29th August. The weather was perfect for painting and all 11 artists got some good work done, some even got more than 1 painting done in the day. We had a lovely lunch of quiche and salads and apple and blackberry crumble for dessert. Once again thanks to our hosts Frances and Iain MacDonald for their hospitality in allowing us to paint in their magnificent garden and providing us with teas and coffees to start the day, lunch at 1pm and a cuppa in the evening while I did a critique of the paintings. The Painting trip to Achill -17th -22nd June 2018 went well. 3 dry days out of 4 and the final day in Keem bay was fantastic, what a beautiful place to paint. We painted in Saula, Dooniver beach, Atlantic drive and Keem Bay. All the artists got lots of inspiration and some great paintings were achieved. Thanks to Bernice, Clody, Esther, Fionnuala, Joan, Maria, Mercedes,Michael, Sheila, Teresa and Viv. Also thanks to the great staff at the Achill Sound Hotel for looking after us so well, Peter, Loretta, Chris and Aimee. The Painting day in the Bay Garden, Camolin takes place this year on wednesday 29th August 2018.You can book at my site -fergalartist@eircom.net or by phone 0877589575 or with the Bay Garden, The cost is €70 and includes an organic lunch.The day commences at 10am with a coffee/tea and a guided tour of the gardens by Frances MacDonald, then I give an introduction talk and we commence painting. Lunch is at 1pm and then it's back to the easels until 4.45pm when I will give a critique of the paintings as you have a refreshing cuppa before departure. You must provide your own paints but I have some easels people may borrow for the day. The Painting trip to Antequera went well. I had 8 artists with me. The town is ideal for painting with a hill top castle and numerous squares and churches dotted around the old town. We also made two trips out -one to the Torcal National park and also to La Joya village. See picture above. Thanks to Diane,Edwina, Elizabeth,Eileen, Gwen,Marie,Noreen and Rose for joining me and also to our guide there Jean whose help was invalauable. See main picture. See Fergal's paintings in the Craft Framing gallery, Dublin Road, Bray. A wide selection are on view and the paintings are changed regularly. Drop in and say hello to Ian McGreevy, curator and have a view of my work. Please sign the guestbook if you are interested in Fergal's paintings or painting courses or wish to leave a comment for the artist. Commissions undertaken.